Some like to use books. The heavy cookbooks are best. The larger the better and don’t stack them too high because they will topple. Some like large cans of various vegetable from the kitchen cabinets. Those fat 28 ounce cans of tomatoes are great but I don’t recommend stacking those over two high. The cans will crash to the kitchen floor or roll off onto the counter and knock over your spice rack leaving a mess to clean up. My mother used two 10 pound hex-shaped dumbbells. This worked well and they would not roll off or topple but, like the books and cans, they still left you with a lopsided block of tofu a few minutes later. I’ve tried all of those methods to press a block of tofu. I’ve tried others that I would rather not mention. I’ve just recently been able to try the EZ Tofu Press after being sent one to test drive. I’ve seen other presses available and considered purchasing but never thought those to be worth the price. After all, I’m simply pressing a block of tofu. I’m not doing such a task everyday, maybe once a week. Some of those presses just look complicated. Parts to lose. Springs to break or wear out. I just don’t see the need for the extra hassle. It should be a simple tool and not one that looks to be a piece of over-thought MIT engineering. 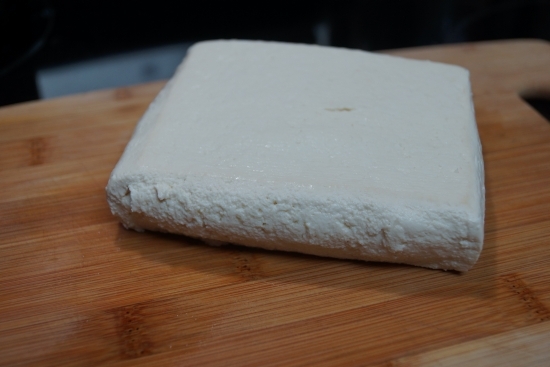 The EZ Tofu Press is the simple tool. The EZ Tofu Press i a vice. Two plastic boards with two screws on each end press your tofu somewhat evenly (more on that later) and leave it ready to marinade. One of the best things is it can be done in as little as 10 minutes if you are in a hurry. 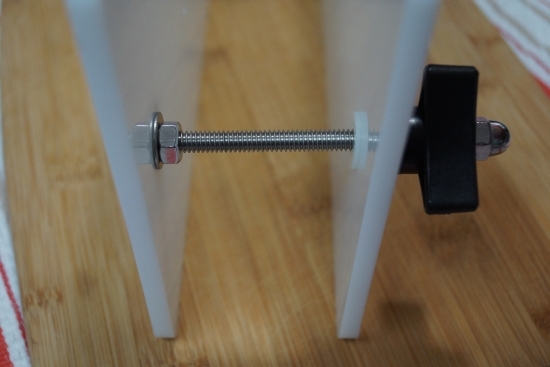 All it takes to press is to place the block of tofu between the two plastic boards and screw each plastic nut down evenly until the tofu block is lightly pressed. After a couple minutes tighten each nut evenly to press more liquid and repeat until you have pressed the block to about half its starting thickness. 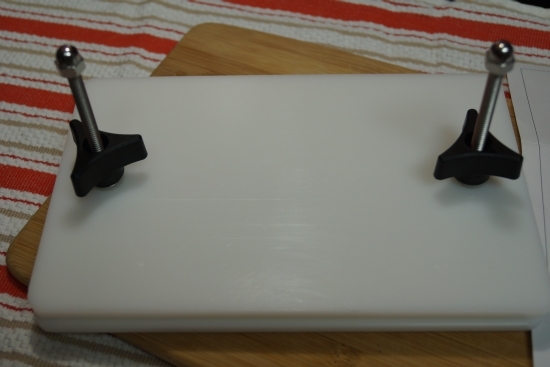 The only fault I can find with the EZ Tofu Press is the thickness of the plastic boards. They are not exactly thin at 1/4″ each but they do tend to bow slightly enough in the middle to not distribute pressure evenly across the block and thereby pressing the ends of the block more than the middle. increasing the thickness of the boards by 1/8″ or adding a 1/8″ -1/4″ piece of plastic on top of each board, opposite the pressing surfaces, between the screws should give a more even press. Still, I am very happy with the results. 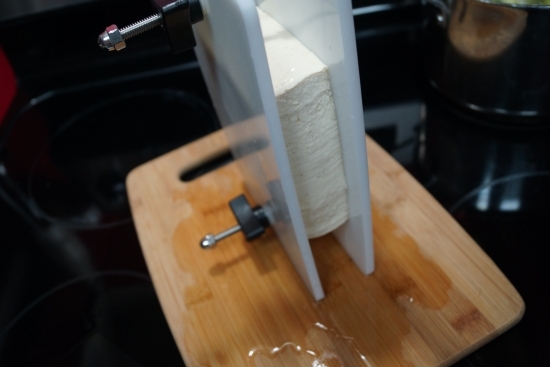 If tofu is in your kitchen there’s no reason you shouldn’t have the EZ Tofu Press. 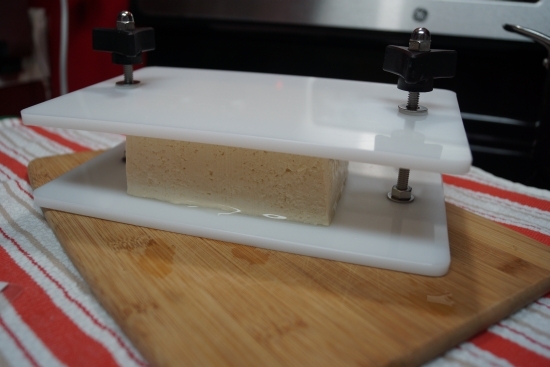 You can have one in your kitchen thanks to Ben, the inventor of EZ Tofu Press. To win an EZ Tofu Press all you need to do is leave a comment below and tell me your favorite way to enjoy tofu. For an extra entry, follow me on Twitter and tweet a link to this post. Be sure to mention me (@nashveggie) so I can count your second entry. I’ll pick a random winner on October 11. Things I love: cooking, spending time in the kitchen, planning a great vegan meal and creating recipes. Just because I love those things doesn’t mean everyone does. For those that really don’t like meal planning and cooking there’s My Veggie Chef. Being one who loves all of those things and loves to put a dinner together form scratch I had to put myself in a different mode for this. I’m not accustomed to having a ready-to-cook meal supplied to me. I decided to go through this review with a mindset of someone who needs that ready to go meal waiting. I’ll put away my make it my way ideas and be the kitchen amateur for this. Well, a little bit at least. I did take a few liberties here and there. I couldn’t resist. 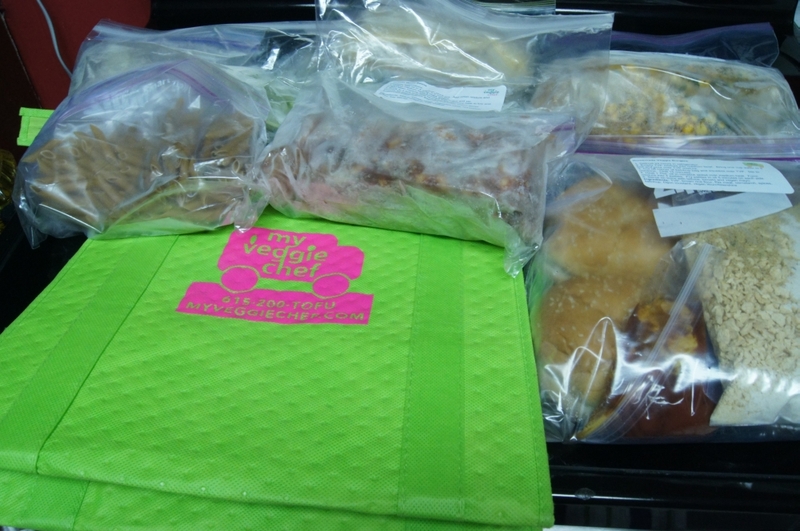 My Veggie Chef is a food preparation and delivery service in the Nashville area operated by Kristen Agee. No, Ms. Agee will not come to your home and take over your kitchen like to some high-priced celebrity personal chef in the Bentley-driven hills of Bel Air. Instead she will prepare your completely vegan meals in her kitchen and deliver them to your home. Individual ingredients are pre-measured and supplied in containers with easily followed instructions. All you add is a small amount of time and maybe water where needed. It’s very simple to have a healthy, vegan meal without all the pre-planning required and trips to the grocery store. 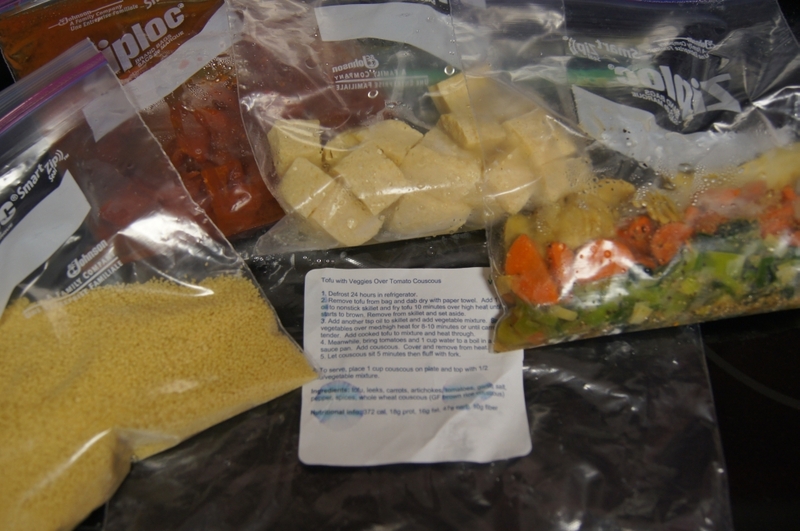 My Veggie Chef meals are supplied frozen. Just thaw and follow the on-package directions. The week of meals from My Veggie Chef that I was supplied were Veggie Burgers, Tuscan White Bean Soup, Roasted Corn Chowder, Pasta with Caramelized Cauliflower and Parsley Pesto and Tofu with Veggies over Tomato Couscous. 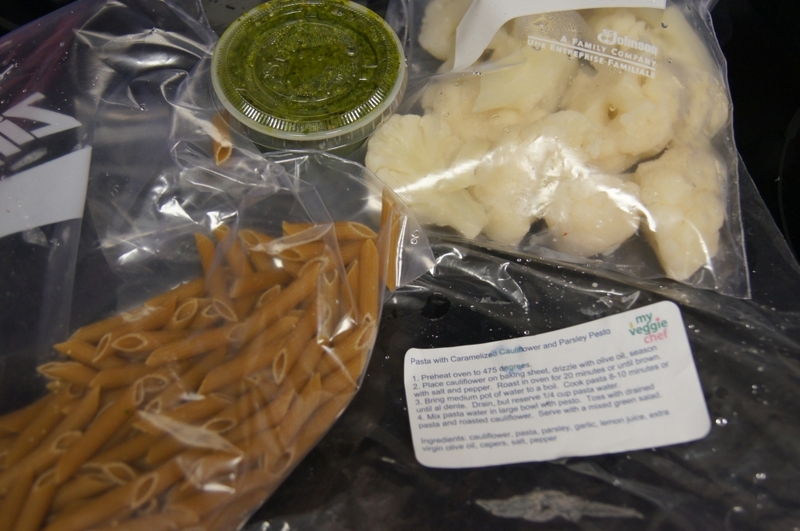 All five meals were individually packaged in Ziploc bags with smaller bags inside for each ingredient. On the outside of the main bag is a sticker with preparation instructions. Everything is typed out neatly but the only thing I would consider adding to the instructions is prep time. Some people like to know exactly how long it will take from the time they start to pour the first ingredient in the pan to the time they’ll be taking their hot vegan din-din from the oven. For parents who pick up kids at school or whatever practice and have a short time at home before dinner must be served that knowledge is helpful. If I have five meals waiting at home for me to choose form ranging in 30 minutes prep to 2 hours and I know Wednesday night I’ll have only 45 minutes when I arrive home to get dinner made before the kid has to go to bed but Friday night I’ll have all afternoon to get dinner planned. I’ll be saving that 30 minute meal for Wednesday night and the 2 hour dinner will likely be made Friday. It’s better to know at a glance. I’m a veggie burger lover and since the complete prep for a veggie burger is there (including buns!) I made that the first meal to try. 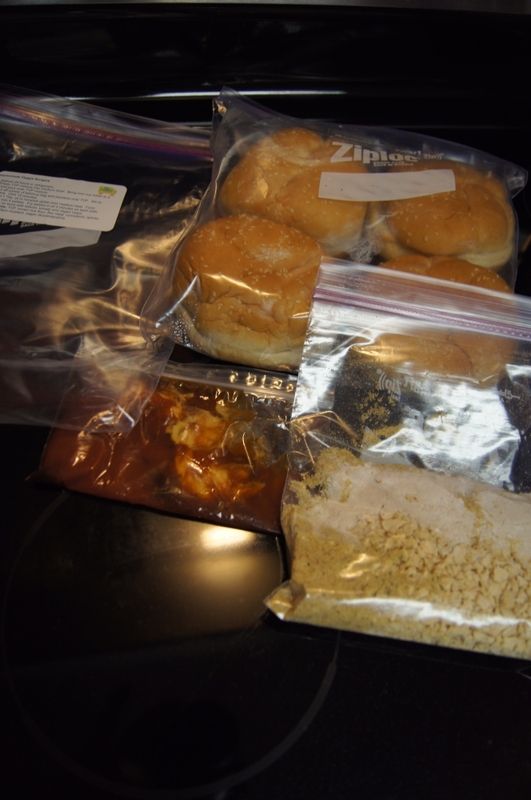 A bag of TVP mixed with spices, corn starch and brown rice flour was supplied as well and a smaller bag of ketchup and vegan Worcestershire sauce. The instructions stated to boil a cup of water and pour it over the TVP mixture then empty the ketchup bag into that and stir to combine. Once mixed well I was to let the mixture sit for 15 minutes. 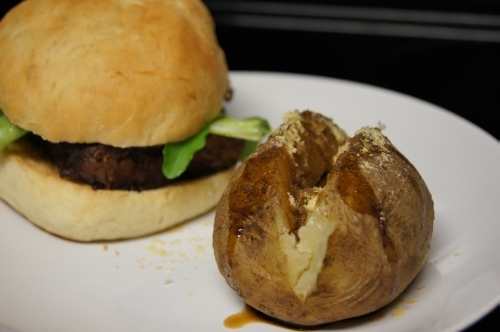 OK, here’s where I had time to reflect on making veggie burgers and how I like them. I skewed just a little but not in the basic directions. A hot pan was ready and into it I put a sliced onion to caramelize while I waited for the burger mixture. 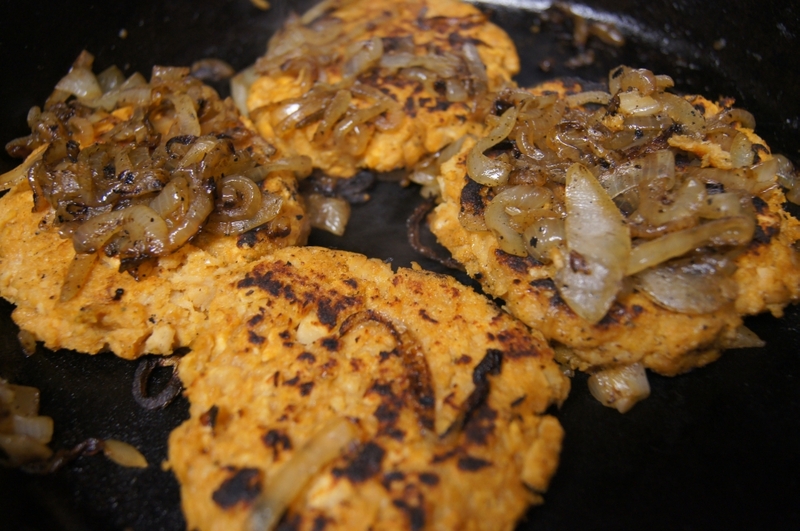 Once the mixture was ready I made four patties and put them into my hot skillet. The directions stated to cook for 5 minutes on each side. Now, I’m sure that sufficient to heat the burgers through but my crazy cook mentality took over. I wanted to see if these things could hold up to the onions and that meant a nice crispy outside and that meant AT LEAST 30 minutes in the pan if not longer. My Veggie Chef veggie burgers frying up. I added some onions because that just how it should be done. Don't be afraid to fry these longer than indicated. The moment you know if you have a homemade veggie burger patty that’s going to work is when you make that first flip with your spatula. I was unsure and honestly had little hope of flipping a burger and it coming down in one piece. No problem, a perfect flip. I covered the pan, a step not stated in directions but a staple in my own veggie burger cooking as it lets the heat cook the burger more evenly and provides a moister burger, and flipped them every few minutes. After about 45 minutes on medium-low the My Veggie Chef veggie burgers were ready. Next step in my veggie burger prep that was not in the directions: a toasted bun! Really, who wants a burger on a cold, clammy bun?I put the buns in the pan with the patties and toasted them well so they were nice and brown on the outside yet warm and steamy moist inside. 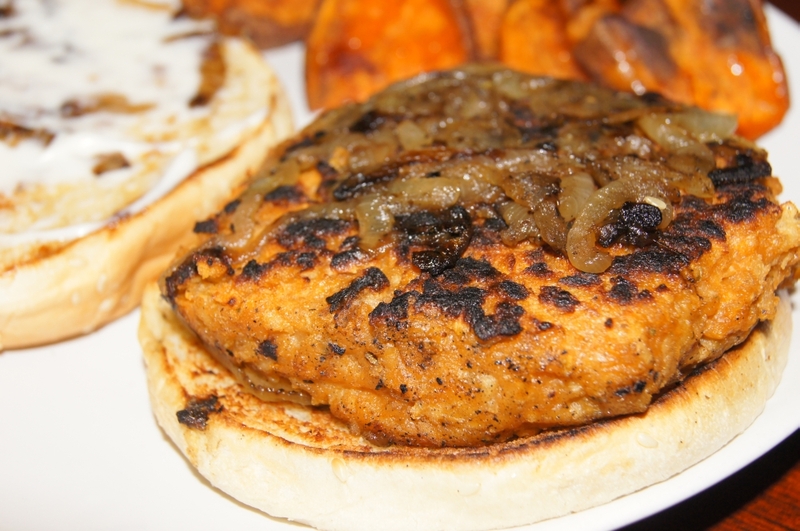 Time to give these veggie burgers a taste, a patty on a toasted bun spread with some Earth Balance mayonnaise and topped with those delicious caramelized onions. I’m thinking these ingredients are too simple and likely I’m going to have a bland burger screaming for flavor. No, actually a very tasty burger! onions. The burgers were spiced well and the texture was excellent. Actually better that some veggie burgers I’ve had in local restaurants. Is it the most complex flavor with perfect fresh ingredients? Well, no but you’re looking for a ready to go meal and that’s what you get. Still, much better than the over-processed frozen patties you’ll find in the grocery freezer. My Veggie Chef veggie burgers ready to munch. The next meal I tried was Tuscan White Bean soup. The contents were in two bags. One bag contained onions and a very important ingredient that was not listed on the ingredient list: garlic. Most wouldn’t think anything of this but if you’re allergic to garlic then this is a big issue. Mrs. Nashveggie is allergic to garlic so luckily I caught it which wasn’t hard since I have a nose in the middle of my face. 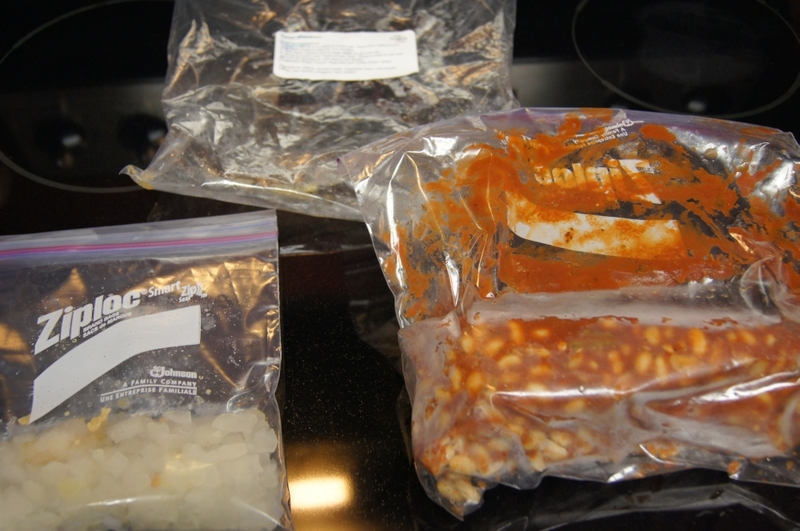 The second bag contained a white bean tomato sauce mix. The cooking instructions for this one was simple. Saute the onion mixture for five minutes then add 3 cups of water and the contents of the bean bag. Cooking this for 45 minutes you should have a ready to eat soup. Unfortunately, this wasn’t the case. After the stated 45 minutes at a boil the beans were still hard and inedible. It took a full 3 hours before the beans were soft enough to eat. 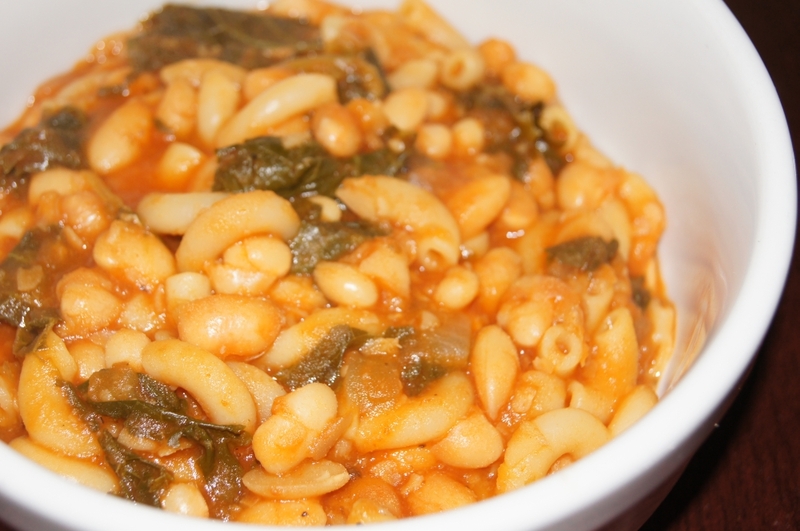 For me this soup needed a signature addition to make it Tuscan White Bean soup: Kale. About 15 minutes before the soup was to be served I added 2 cups of shredded kale and it made the dish. My Veggie Chef Tuscan White Bean Soup. I added some kale and a little pasta for a one bowl meal. Next up, Roasted Corn Chowder. Another two bag meal this one was stated to be ready in about 15 minutes with the combined cooking times of each stage. Instructions were similar to the Tuscan White Bean soup. One bag contained onions and peppers to be sauteed for five minutes. 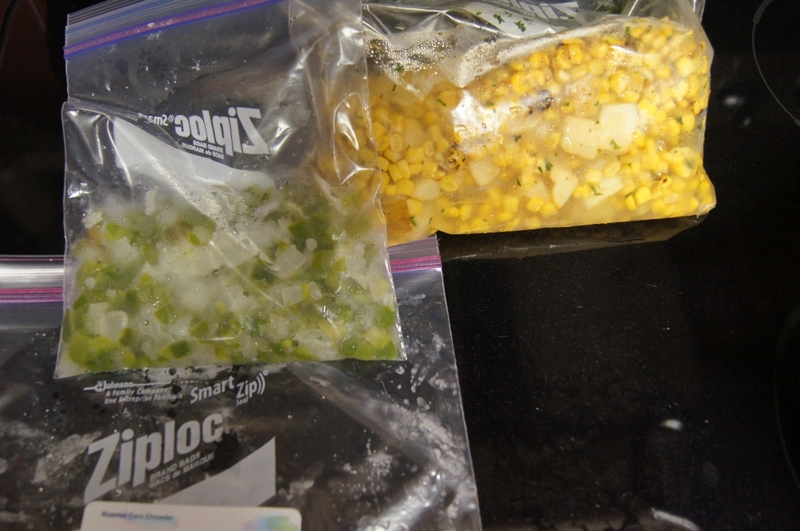 The next bag contained spices and corn to be added along with one cup of water. The next step left a bit of confusion. ‘Add soymilk’. How much soymilk? A guess? To taste? Being a seasoned cook I had a general idea but for the person likely preparing these meals it could be a loss. I added 1 1/2 cups of unsweetened soymilk and cooked for the stated time but the flavors just didn’t seem to mesh. I simmered another 30 minutes and this one was just flat. If I added too much soymilk causing the flavor to become bland then there would be very little soup between 2 people by adding any amount less. It definitely needs more in the flavor department. 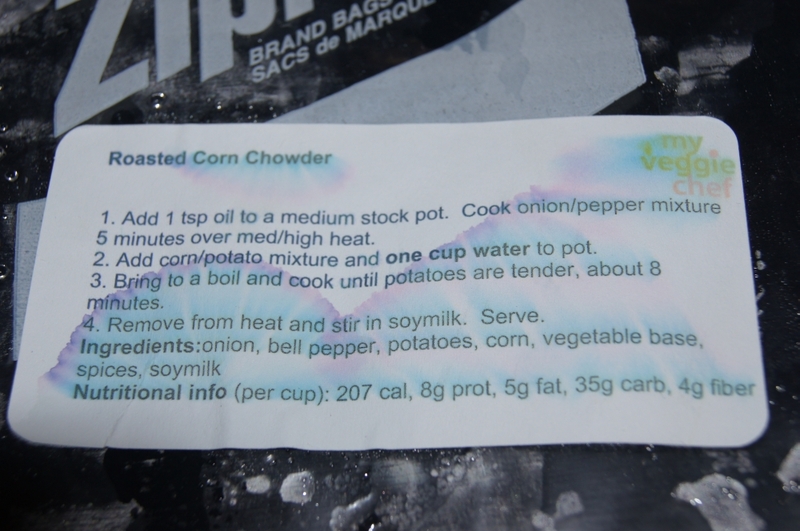 Roasted Corn Chowder cooking directions where in step 4 it does not state the amount of soymilk to be added to the soup. 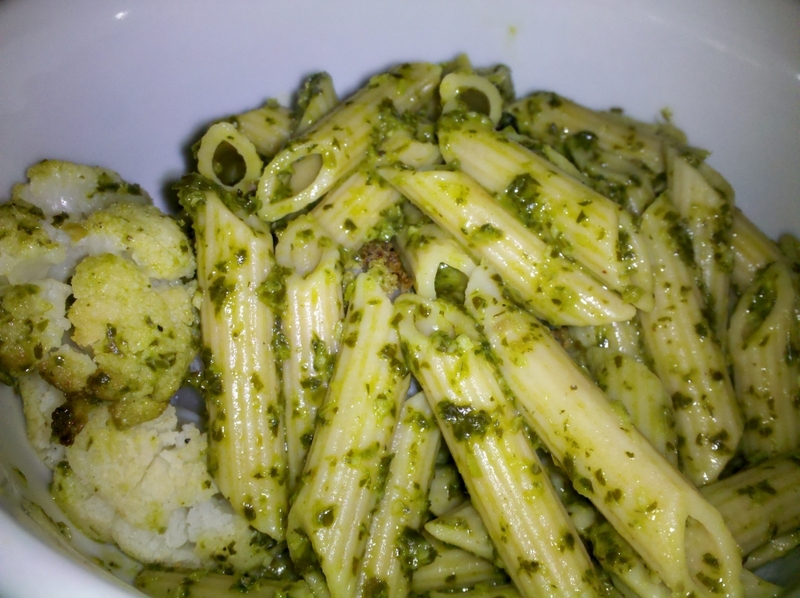 Pasta with Caramelized Cauliflower and Parsley Pesto I made for a quick dinner one night after getting home late. I think “caramelized cauliflower” is a misnomer. It should be “roasted cauliflower” as you’re doing no more than roasting the cauliflower in the oven for a short time until it’s lightly brown. The cauliflower did roast nicely with a little salt and pepper and pasta is simple enough to prepare. The pesto, however, was a bit bland. It could have used some salt and was missing the key nuttiness I find a staple in pesto. I typically use walnuts or cashews in my pesto and I’m not a fan of the traditional pesto ingredient of pinenuts but any of the three would have been a welcome addition. 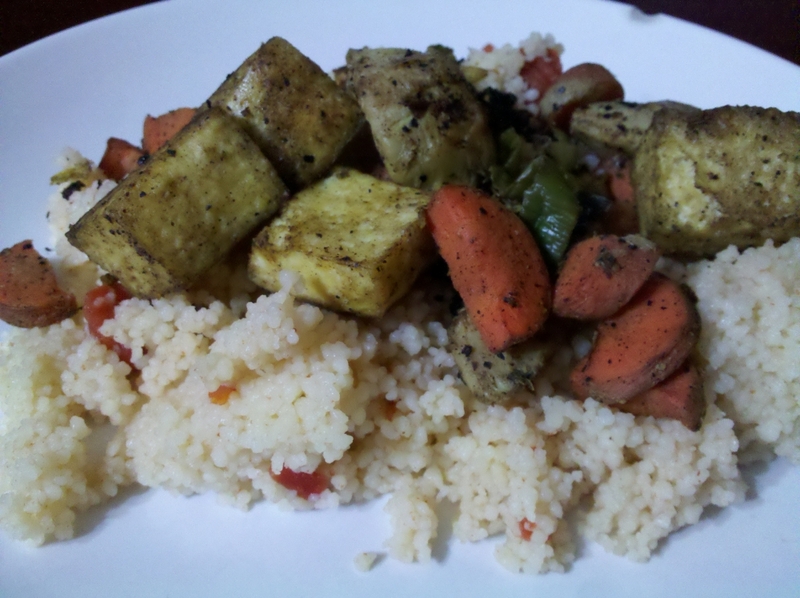 The final meal in the pack to be prepared was Tofu with Veggie over Tomato Couscous. This one took a bit more prep time than some of the others. Frying tofu then frying veggies as well as the plan ahead if following the package direction, which I did, meant knowing 24 hours ahead you’d be eating this meal. The first step is to fry the tofu in a little oil. I did just that but quickly noticed that the tofu was just plain tofu, unseasoned. I did not waiver from the instructions by adding any seasoning but any vegan knows what unseasoned tofu tastes like, nothing at all. Tofu prepared I sat it aside and went in on the veggies by frying them in the same manner. Nice chunks of artichoke with carrots and small slivers of peppers went into the pan and I quickly noticed this dish was heavy on the cumin as the scent quickly filled the house. Water and tomatoes boiled and couscous was ready. All together and ready to eat this one turned out fairly well except for the tasteless tofu. I would recommend some seasoning added to the tofu beforehand. It would make this dish stand out and give it the flavor where it was lacking. The veggies tasted very good with the couscous, however. These meals when following directions needed a nudge here and there. If you’re comfortable enough in the kitchen then these will give you enough of a start to where you can add your own touches to make then a little better than out of the bag. As I stated a few places, some extra seasoning, and extra directions, would come in handy. You can sign up for emails from My Veggie Chef as well. Doing so will get the weekly menu sent to you so you can decide if you’re feeling that weeks flavors. You can then go to the website and order your meals. The meals I reviewed were enough for 2-3 people but My Veggie Chef has an option for meals for 4-6 people. Meals for 2-3 cost $80 for five meals and the 4-6 serving 5 meal plan is $160. Despite the shortcomings with some of the meals I tried this is an excellent service for local vegans, or vegetarians and even those who just want to eat a little healthier, and those who are in a time crunch to prepare dinner My Veggie Chef can help you out. My Veggie Chef only delivers within a 20 mile radius of downtown Nashville but outside of that delivery area pick-up is available. By now everyone has heard of the Engine 2 Diet and its Plant-Strong plan focusing on meals of fruits, veggies, legumes, nuts and whole grains. The bestselling book, The Engine 2 Diet, by Rip Esselstyn has been in the news and is seen in every Whole Foods which has developed a healthy eating guide based off the diet plan called Health Starts Here. We believe that food in its purest state — unadulterated by artificial additives, sweeteners, colorings, and preservatives — is the best tasting and most nutritious food available. Eat a colorful variety of plants. No matter what type of diet you follow — including those with dairy, meat or seafood — reconfigure your plate so the majority of each meal is created from an abundance of raw and cooked vegetables, fruits, legumes and beans, nuts, seeds and whole grains. Get healthy fats from whole plant sources, such as nuts, seeds and avocados. These foods are rich in micronutrients as well. Work to eliminate (or minimize) extracted oils and processed fats. Choose foods that are rich in micronutrients when compared to their total caloric content. Micronutrients include vitamins, minerals, antioxidants and phytochemicals. The diet emphasizes the use of fresh fruits and vegetables and whole grains. It also makes a strong case against the use of added oils encouraging all fats come from those already found in foods such as nuts and cooking using vegetable broth as a replacement where oil is typically used such as sauteing. We were invited to a Health Starts Here event by Whole Foods Green Hills culinary demonstration that was instructed by Chad Sarno. Sarno is a classically-trained chef and a co-founder of the Health Starts Here program. He has owned vegetarian restaurants in London, Turkey and the US. The demonstration class focused on dishes that could be made quickly and preparing ingredients in bulk to make the prep quicker. Cooking enough beans for a week’s worth of meals. Making sauces in portions to be used for many dishes as well as full dishes that could be kept in the refrigerator for easy lunches. All of the meals prepared used no oil and no salt. In place of salt Sarno had created as seasoning mixture he calls Wicked Good Spice and Seed Blend, a mixture of sesame, sunflower seeds, flax and nutritional yeast. Instruction was given in making your own almond milk as well as a basic white sauce. 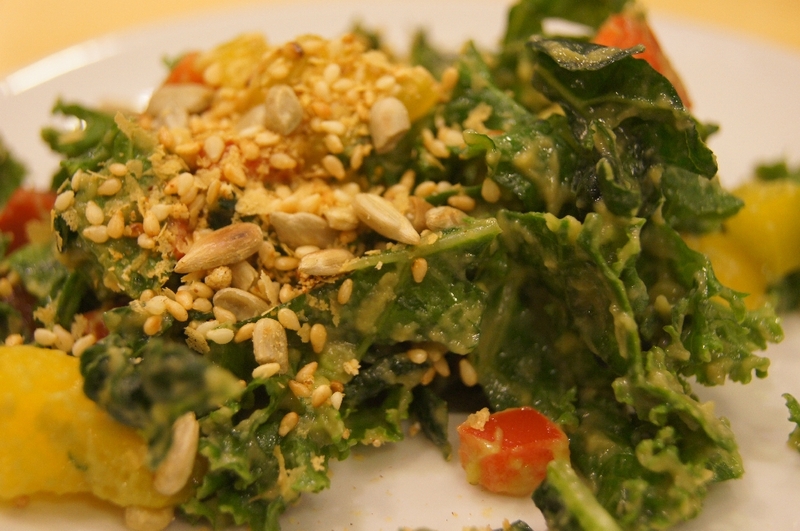 The quick and simple Kale Avocado Salad was one of the most surprising dishes created. Kale, tomato, avocado, onion and the juice of a lemon made a very flavorful and satisfying salad without need for any extra seasonings. Quick and simple it can be kept in the refrigerator for a grab whenever the craving came. I could easily go on about the dishes but it’s best to just give you some recipes. Give these a go and don’t worry about the omission of salt or oil where you may be accustomed to adding them. They’re unnecessary. The flavors pop in these. Toss all together and store in shaker or air tight container. Great all purpose seasoning. This is a very simple, quick and delicious dish. Completely raw. In mixing bowl, toss all ingredients squeezing as you mix to wilt the kale and creaming the avocado. Serve immediately. Saute onions and garlic with stock and steam fry until onions are translucent. Add to blender with soaked cashews, soy/nut milk and rest of ingredients and blend adjusting thickness to desired consistency. Add fresh herbs to finish. Sauce will reduce and continue to thicken on its own with time. Use as a base for any other sauces. 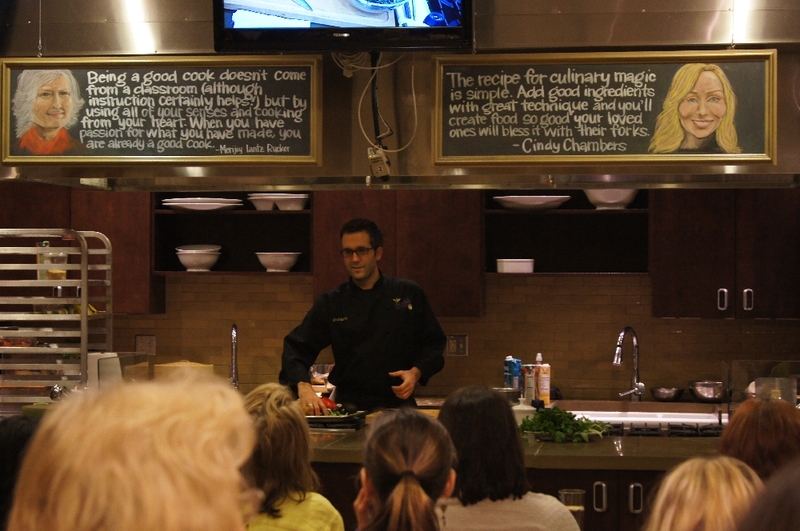 Chad Sarno has a return visit planned for Salud at Whole Foods Green Hills with a class on vegan cooking. The class is set for sometime in April/May. I’ll post dates and more on it when information becomes available. I’m a lover of sauces. I cook with it and pour it on my food. I even make my own barbecue sauce. One of my favorites is Worcestershire and one of my favorite uses is putting it on a baked potato. I know that may seem odd to some but until you try it don’t sneer at it. Up to now the only vegan Worcestershire sauces I’ve found have been Amy’s and The Wizard’s. While good, both of those are a little to thick for me and don’t quite hit the flavor. I just discovered Robbie’s Worcestershire, a vegan Worcesterchire that is the most perfect vegan Worcestershire I’ve found. What makes Worcestershire not vegan, you may ask. Anchovies. It is the ingredient in most conventional Worcestershire sauces though I never remembered tasting it in sauces from Lea & Perrins or French’s. 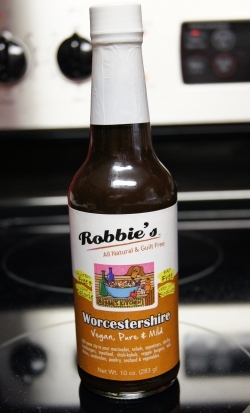 Robbie’s Worcestershire is thin, just as every conventional sauce I’ve used and has the absolute perfect flavor. As a plus, it is the same price as Amy’s and The Wizard’s for twice the amount. Robbie’s Worcestershire is available at Whole Foods in Franklin. Time for some potatoes on the grill! I lost the taste for cow’s milk before I went vegan. The last drink of cow’s milk came from a coffee that was made using bad milk. Hot, rancid milk is one thing but add some strong coffee to it and it just enhances the flavor. After that I started drinking soy milk exclusively. I toyed with different brands and different flavors finding the one I preferred. I went with store brands but found them too chalky and paper tasting. I tried 8th Continent but found at the time they added Vitamin D3 (from sheep’s wool) to their milk, a practice they have since discontinued. I went with Silk vanilla for a very long time as my choice but lost the affection for such a sweet taste and moved to the plain variety. I then tried unsweetened and found it to be perfect. It was the perfect cereal milk, coffee milk and straight out of the carton milk. It also cooked very well and didn’t lend a sweetness to my recipes. I then read about the company which owns Silk, Dean Foods, and how they are the leading operator of factory farms in the US. I also read about how they get a portion of their soybeans from China and there is no sure way to know under what conditions those beans were produced or if they are actually organic. When Whole Foods opened I noticed they started carrying Organic Valley unsweetened soy milk. I had used Organic Valley soy milk previously and liked their flavor but they did have a bit of texture to them I didn’t like, reminiscent of a whole cow’s milk. I decided to go with Organic Valley unsweetened for a period. It didn’t make the best coffee but worked great otherwise. You can also find out exactly where the soybeans that were used in the carton of milk you have are from by going to their website and typing in a code from the carton. I have since tried rice milk and find it pointless, why not just use water? I have tried hemp milk, full of nutritional value but a little pricey. I haven’t tried almond milk yet but get many recommendations to do so. One thing I don’t miss from the days of drinking cow’s milk is the phlegm you get form downing a glass of milk. None of that stuff with the soy milk. Soy milk even makes great ice “cream”, if you don’t want to make your won get a carton of Purely Decadent. Better than ANY traditional ice cream I have had. I have considered going back to Silk unsweetened just for coffee since it steams well but I don’t want to be any more hypocritical than I already am. I know somebody is just waiting to get me for it if I do.